The Palastinians as a cohereant social group have not existed in the land now occupied by Israel. The closest we have come to defining this group archeologicaly is to venture a word about the “sea people” that rampaged through the mediteranian area, felling long standing societies such as the Mesopotamians etc. AROUND 1200 BCE They have been tied to Goliaths group, Phillistines, by many historians. After their escape from Ramses, Moses and his people entered Canaan, annihilated or set to flee the entire population. In most Rikky-tic fashion the only people in Canaan were Jews. As a matter of boring old fact, only the Jews have a written history of residence in the area for 3K years. 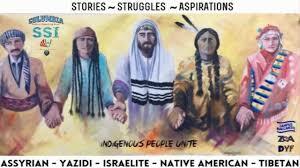 By most stringent standards the Jews are the inherent indigenous peeps. The article this simple little pic is linke to is simple and highly educational…Klikdapik…. . This entry was posted in History and tagged History, palastine. Israel by jackhammerjohn. Bookmark the permalink.